The museum's gardens, a green oasis in the center of the city, consist of three areas. Each changes with the season; all await your visit. 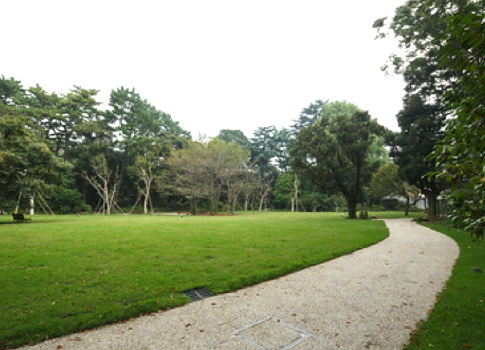 This spacious area, which has been covered in a beautiful lawn since the days when the museum was the Prince Asaka Residence, offers a breathtaking sense of freedom. The large Aphananthe aspera tree in the center is said to have been transplanted there from near where the Great Dining Hall is now in the Main Building during the construction of the Prince Asaka Residence. 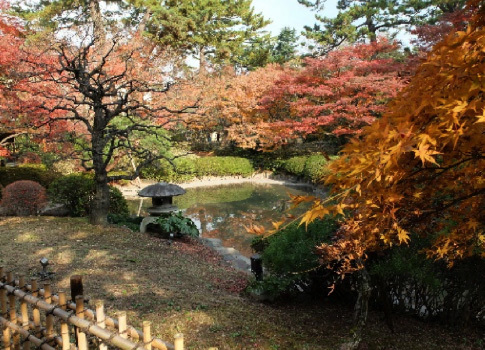 This garden also lives on from the period when the site was the Prince Asaka Residence. Its features include a small hill and a pond for views of a richly varied, rolling setting. Its tea house adds a distinctively Japanese touch. The autumn foliage in the Japanese Garden is not to be missed. This area was originally occupied by housing for civil servants serving in the Imperial Household Ministry. It was later turned into a garden and transferred to the museum. In 2018, improvements to the paths and trees have made it an even more relaxing space. In spring, cherry trees that were a return gift from Washington, D.C., are a lovely sight. *Last admission to the garden is 30 minutes before closing. • Admission is free for visitors (and one accompanying person) with a Physical Disability　Certificate, Intellectual Disability Certificate, Rehabilitation Certificate, Mental Disability Certificate, or Atomic Bomb Survivor's Certificate. • Admission is free for seniors (65 and above) on the third Wednesday of each month. • Smoking, other than in the designated smoking area. • Play using balls, rackets, or other equipment. • Pets (except for service dogs). • Using musical instruments, radios, or music players. • Any other behaviors that would disturb other visitors. The teahouse at the Former Residence of Prince Asaka, designated by the Japanese government as an Important Cultural Property was designed by Sason (Zesokuan) Nakagawa (1880-1957), a master of the tea ceremony from the the Mushako jisenke school, and constructed by Masaya Hirata (1900-1980), a master carpenter of teahouses and other traditional wooden buildings from Osaka. It was completed in 1936. The name 'Kouka', combined of two Chinese characters meaning 'light' and 'splendid' to give a meaning of 'resplendence', is said to have been bestowed by Prince Yasuhiko Asaka himself, and the plaque with the tearoom's name on it is written in the Prince's own hand. 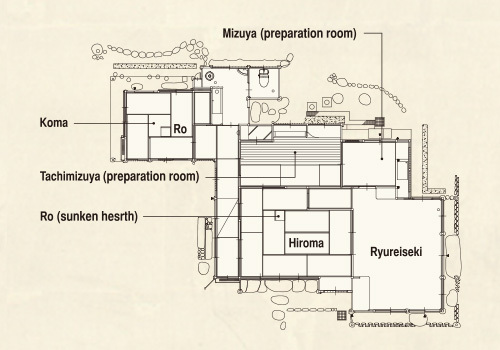 The structure is comprised of three tearooms: the koma, or small room; the hiroma, or large room; and the ryureiseki, or seated tearoom. The roof itself is made of sankawara, or slightly rippled tiles, while the eaves are made using the kokera-buki shingling technique, where many pieces of wood, in this case plated with copper, are layered on top of one another. The ryureiseki, or seated tearoom, was devised by those from the Urasenke school of tea in 1872, in order to cater for overseas guests unused to sitting on tatami. It would go on to become popularized within various schools of tea ceremony after World WarⅡ, but its inclusion in a pre-war teahouse like Kouka is something of a rarity. The teahouse is notable for its high ceilings and bright, spacious structure throughout, reflecting the tastes of the Prince, and harmonizing well with the Art Deco interior of the main Residence building. In 2015, the teahouse, along with the main building, was designated by the Agency for Cultural Affairs as an Important Cultural Property, and in 2016, earthquake-resistance reinforcement works were carried out on it. 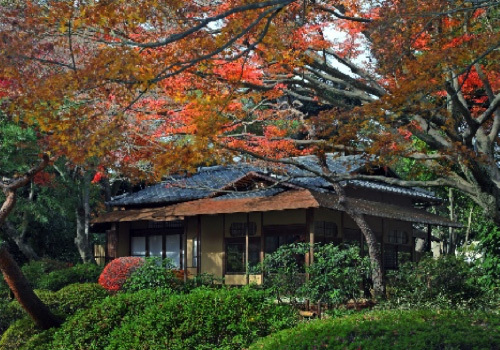 Only the ryureiseki (seated tearoom) is open to visitors. Closed when the gardens are closed. Included in the admission fee for the gardens.